To say that I love chocolate would be an understatement. My feelings towards chocolate are beyond admiration, appreciation, or even adoration–they approach full-out obsession, but not in a sad, “I’d rather die than give up chocolate!” sort of way. My chocolate obsession is much more of an elitist sort of thing–it’s the kind of obsession that points out the flaws of all sweets non-chocolate and exposes them for being overly sweet, lacking in complexity, and, well, vanilla. Thus, it is rare I find a baked good that has enough chocolate to satisfy my chocolate needs–especially when it comes to cookies. Attempts to make flat yet substantial, chewy but not puffy chocolate cookies all ended in disappointment. It helped–and I all but danced a happy chocolate jig–when I discovered Hershey’s had started making dark cocoa powder, but I still lacked the right recipe to make the crisp-yet-fudgy, deep, dark chocolate cookies I salived over in my dreams. Well, I recently found that perfect recipe–and, as often happens, I have Ina Garten to thank for that. 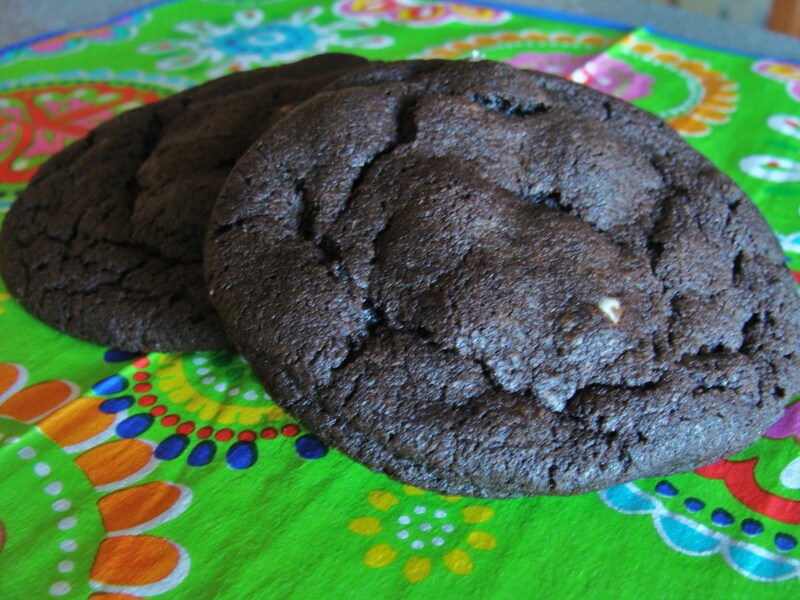 These double chocolate cookies are incredible. They almost taste like a complex Oreo with a soft fudge-like middle and crispy, crunchy edges. The white chocolate chips pop, both in flavor and color, against the deep, barely sweet chocolate cookie. The original recipe calls for almond extract, which I omitted, but I’m sure it’s fantastic when produced as written as well. Almond addition or not, these cookies will become a staple in your repertoire (and your cookie jar) in no time at all. The recipe for these wonderful cookies can be found here. Happy baking! Good lord that looks like I could seriously lay into that.